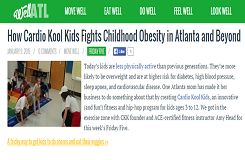 Cardio Kool Kids is a complete wellness curriculum for children in grades K to 5 that innovatively combines sports, dance, and health education. WAIVER: I hereby agree to release and hold harmless the Mt. Bethel Elementary School Foundation (MBESF), its officers, trustees, and representatives and Cardio Kool Kids, its employees and representatives, from any responsibility, loss, liability, damage or costs which Participant may incur in this after school program whether caused by the negligence of MBESF and/or Cardio Kool Kids, the negligence of Participant and/or others, or due to accidental occurrences. In the case of injury or medical emergency involving Participant, if a parent or guardian cannot be reached, I give the Cardio Kool Kids program representative(s) permission to seek appropriate first aid or medical care and I agree to be fully responsible for the cost of any services provided. MBESF CODE OF CONDUCT POLICY: I have read and understand the FACT Program Code of Conduct. I understand that if my child is removed from a FACT program due to violation of the Code of Conduct that I will not be refunded any tuition or program monies that I have paid. MEDIA: Cardio Kool Kids classes and special events provide photo/multi-media opportunities to recognize students’ accomplishments and activities. Cardio Kool Kids occasionally uses these media images for promoting the program in publications and websites. If you do NOT want your child’s image to be used, please check the box below. Please note MBESF policy: FACT Programs will be cancelled when school is not in session due to any reason, including early release for weather conditions. There will be no make-up classes.